Paramaribo exhibits a unique blend of indigenous and Colonial Dutch architecture. 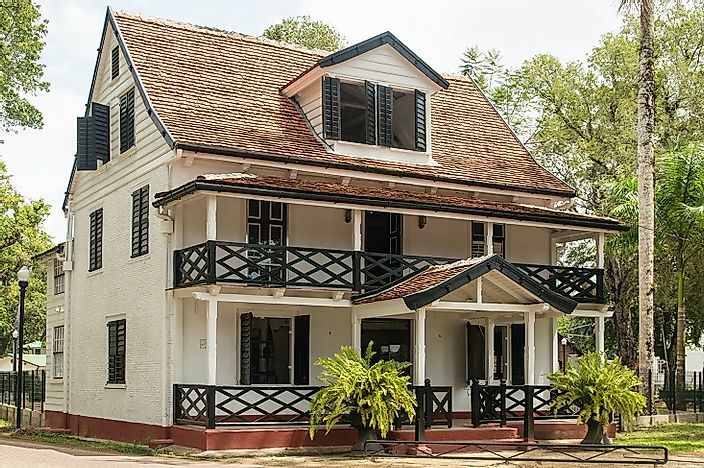 Historic Dutch Colonial architecture can be seen throughout Paramaribo. Located in South America along the banks of the Suriname River, Paramaribo is the capital of the small country of Suriname. More than half population of the Suriname lives in Paramaribo, which experiences a rainforest climate. Earlier, it was a famous trading post and was under the Dutch colonial reign. It has a multi-ethnic population comprised by a mix of South American indigenous peoples, Indians, Indonesians, Chinese, Europeans, and descendants of slaves from Africa. The city's history dates back to the 17th Century when the Dutch founded the city to facilitate trade via Atlantic sea routes into the New World. However, Englishmen established permanent settlements in Paramaribo within around 25 years of its foundation by the Dutch. They made it the capital of their colony in Suriname in 1650, but Dutch managed to regain control after more than a decade. In the 19th Century, Dutch abolished the practice of slavery and consequently, many Africans settled down in the city. It was only in the 20th Century, the city became prosperous due to the discovery of precious metal gold and oil excavations. Paramaribo has a large number of tourist attractions, including Fort Zeelandia, the Neveh Shalom Jewish Synagogue, the Presidential Palace, Peperpot Nature Park, Grote Stadskerk, and many more. Of these, Fort Zeelandia is the most popular among tourists. Located on the banks of the Suriname River, an English commander reconstructed the fort. It also possesses an underground prison cell. There are even two beautiful cathedrals in Paramaribo, which draws a large number of tourists every year. One of the most unique aspects of the city arguably lies in the fact that so many people of multiple ethnicities and cultural backgrounds live together peacefully. It has houses, which are a unique blend of the Dutch and European architecture. The urban fabric of the city is more or less unaltered since 17th Century. The city borders the Suriname River to its south and a canal to its northeast. In the southeast lies the historic Fort Zeelandia. One can also find plenty of restaurants and bars surrounding as well as within the city. As far as sights and sounds are concerned, Paramaribo offers some unique sights, such as the maroon area of the central market where people sell a range of traditional medicines, caged monkeys and a lot more stuff that is interesting. The sound of chirping birds fills the surrounding air of the city. Many travel agencies are now even arranging bird watching tours or trips to its surrounding areas where one can spot a large number of small size birds of varied colors and species. The city is under a constant threat due to drug trafficking and a host of public health problems. Since there is an acute shortage of affordable housing, existing houses are overcrowded and people are facing immense difficulties. One more persistent problem is the decay of old distinctive buildings that makes the city unique to the tourists. Many steps are taken by the government to minimize these problems including painstaking restoration of old buildings, improvement of health facilities, construction of new houses and much more.